I am trying to get my mind around some questions that have been annoying me for years, many years. What type of room is cooler? I need to test a couple theories. Now, what a bag of worms that is, this questions, just me saying the question makes me realize there are hundreds maybe thousands of type or roofs on the planet. I think thousands would be difficult to find. The walls and the roofs rather set the standard for coolness of the room, now in my opinion the windows or the doors are the problems, and people really underestimate the value of a tree with shade. I may have found a test home, or more correctly, I may have found two of maybe four major types of homes to measure for heat. I can run a very simple test on the four types of homes. 1. HAVE - Home with steel roof and no dead air space. 2. HAVE - Home with steel roof and dead air space. 3. NEED - Room with concrete roof. 4. NEED - Two story home of concrete with room on lower floor. Controlling the variables is difficult, however to control the people is a more complicated problem. People in the more primitive countries do not like me to be curious or solve problems, there is not a big hypothetical, what if this, and how do we do this type of person that is easy to find. They exist, but I think the see me coming and hide. I call these people now 0 and 1 people. I have found a few in my travels who can think in what if terms, and was thinking the other day while looking for some mosquito net material I have slowly developed an extremely valuable skill. I am slowly learning to be and expeditor to find sources in other countries. I can find items to buy or sources of information about 100 times faster than when I started to travel 10 years ago. I will blog this separate. One subject one blog post, the secret to making money on the internet, or one of them…. In addition, a good way to stop getting annoying emails from readers. An adaptation of diary idea, and really is good. Well, it become a circus of silly and annoying complicated, overwhelmingly difficult to solve culture problems. To walk into a home owned by a Mina person, which is made of clay adobe, and leave a thermometer in the room long enough to read correctly at exactly say 3:00 in the afternoon is a taxing mental cultural frustration for me. The simple way is to be a bully, but not the polite and I think they say, Gentil way. I am thinking of that movie with Russell Crowe here gets that man out of Colombia and almost does the wife. I am doing some extensive reading on the Scientific Method or maybe … just terms. I am trying to understand and identify the one variable of a solving a problem that is 100 percent needed to solve the problem. The one problem that is the lodestone to solve the complete problem the one specific issue that stops or starts all problems and solutions. Malaria is a killer, I am guessing, but I think it kills more than AIDS or SIDA, and I am hypothesizing that all the geese are flying the wrong direction. I am arrogantly under the suspicion that all the Malaria or Paludisme research has failed to solve the one missing piece to this puzzle, that would stop malaria on the planet or bring to a Tuberculosis level end. The world has solved MASS problems of Malaria and knows how to treat Malaria, however the remaining residual number of deaths by Malaria remain to be very high, yet difficult to say a big world problem, however maybe bigger than AIDS. Malaria now does not make world headlines, as it is an old issue; a new issue is what world shattering news becomes. Global Warming, which in my opinion has not killed anyone is news, while Malaria an everyday killer and car traffic deaths, probably the number one killer are ignored. Cars are dangerous, they are killers. Ok, this is the hypothesis in a non-thought out and lacking in clear explanation. I believe that people in Tropical climates and where Malaria, Paludisme is most prevalent, in these areas there is a short list of small changes needed to alter in house designs that would solve maybe 50 percent of the now existing deaths from Malaria. My ideas revolve around one specific idea or problem. I think people do not use Mosquito nets because the are difficult, awkward and too hot. 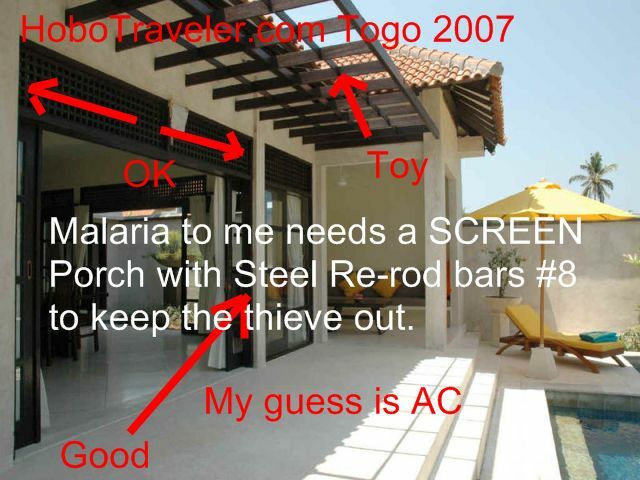 I observe that the average traveler or 99 percent of travelers in Malaria areas do not carry a Mosquito net. There solution is medicine, they believe they will either meditate to avoid or medicate to solve. There are so many dynamic problems to solve to stop Malaria, so many that the people who contracts malaria just stops trying. I tried to buy a Mosquito Net yesterday, two hours of work, and no net in my outrageously persistent hands. The one shop wanted 26 US dollars, the only one I found, and the Hospital Store was closed on Saturdays, I now need to check on Monday or Tuesday, maybe again Monday is a holiday. To stop malaria a person in a village, with no electricity and no education one needs to just stop the mosquitoes with very simple methods, I think they do burn and make smoke Amlame, Togo was full of smoke. I am not sure the goal at the Hospital, do they want the poor person on the Danyi Plateau to come here and buy one? The obstacle involved in using a Mosquito nets are so overwhelming against me using a Mosquito net, that unless I am being bit every 10 seconds, I do not set one up. I on the other hand set up one if there is a way and I get one mosquito bite. However, maybe the truth is when the no-see-ums bite me, I set up the Mosquito net quicker. I truly despise the task of setting up a mosquito net. In a room with hooks, made for a mosquito net, it is very simple, however this room is only about 1 in 100 rooms. I enter of hotel rooms in Tropical Malaria prone areas of the planet daily. I can however, strangely in Africa, find a room with screens on the window in easy in West Africa, easy, however NOT in South, Central America, India or Asia, they do not have screens. This is a never-ending thread of thoughts to explain. The most comfortable home for me, would be a home made like a very fully screened in porch, with a roof that does not turn into a green house, every wall a screened in porch. I am not sure, I think the tents in Iraq, have flaps that go up, I am not sure about the mosquito nets or having the sides with screens, but somewhere along these lines, an open air room. Non-Cooked clay bricks are not the best to make a screen porchs, concrete, the new worlds building material is better; a combination of steel re-rod and concrete could maybe work. The solution needs to cost less to build than the normal design and needs to be five times more comfortable than their present design. Then be easier to make, wood is scarce of expensive I think, these homes need to have screened window whereby you can attach screens… Termites? The bigger problem is thieves, home are probably built first for protection and later for comfort. The end of this for now. Note when doing research in Africa, the biggest problem is the library is in the USA, and I am in Togo. The GPRS Cell Phone internet connection may be a world changing research device. A person can go to the problem, and still have the library with them. I was told Boy Genius for India that BGAN may start giving unlimited internet access for a set fee, I have yet to get or bleed the details from him. I was hollering a guy the other day, piss down hill, not up, strange how long it take to learn not to piss into the wind or up hill for the general population of the whole planet and especially including the USA. Without a toilet, they would be helpless. Edison, Scientific Method, Deductive Reasoning, Inductive Reasoning, Heuristic Reasoning, Problem Solving, Paludisme, Malaria, Mosquito Net, Mosquito. Research, GPRS.